We’ve just survived CES 2015 where every company is looking at objects and wondering what happens when you throw a wifi chip in it. The Internet of Things is a broad term that sells users on the promise that ‘things just work together’ when in reality, that’s really not the case. Connected devices often have individual apps created by the company to control their devices. Step outside of that with another device from another brand and you’re kind of on your own. The best service to date to do the middleware has been IFTTT, which is awesome, but I found something better for IoT. A lot of these companies publish APIs (unfortunately not all) which allows services like Yonomi to be the aggregate service that takes multiple devices from a range of brands and make them work together. For now, Yonomi works with Belkin’s WeMo Switch, Nest thermostat, Jawbone Up, SONOS speakers, Phillips bulbs by Hue and Android phones. It’s a safe bet that we’ll see this list grow dramatically in the future. Launched at the DEMO conference in November last year, the service has stayed relatively quiet, until now. To get started, install Yonomi on your Android phone and create an account. Next the app looks at connectable devices on your local network and makes adding these incredibly easily. There’s no switching to the IoT device WiFi network, inputting your WiFi password or any of the junk. 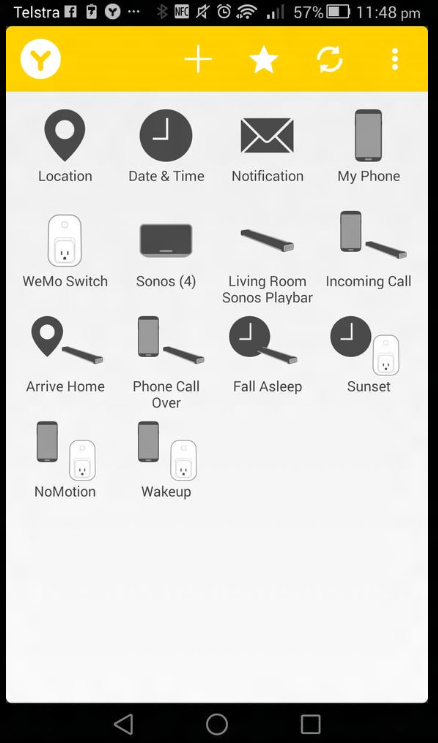 In my experience, the app found 4 SONOS speakers, my WeMo Switch and of course the phone itself. The smarts start happening straight away with suggested routines. These routines can leverage a bunch of things that the devices surface. These include Date & Time, sunrise, sunset, location (as in you arriving home) push notifications from the phone and more. Here’s where things get awesome. 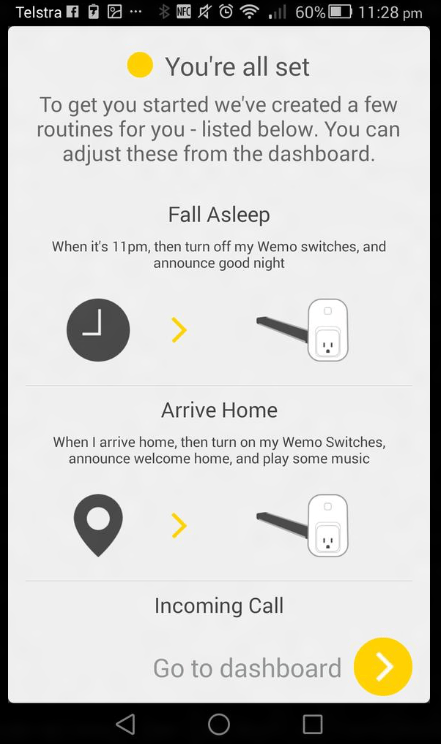 You can configure routines like ‘Fall Asleep’ that detects the phone has been still for a period of time and can then power off the WeMo to kill the lights. If you have Hue lights, you could have these fade up at sunrise, or sunset based on your preference. You can have the SONOS speakers talk to you, like saying ‘Welcome home Jason’ when you walk in the door. Knowing you’re location and where your home is, allows the system to connect the dots. Even better, once your SONOS is done talking to you, you can have it play your favourite playlist. 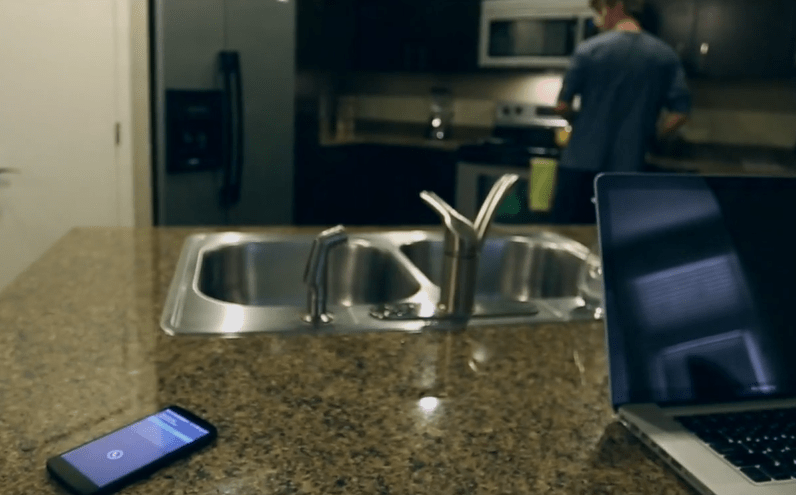 This tips IoT devices from something that’s just cool, well into the camp of actually useful. These devices feel like they’re starting to work for you, in the way we were sold on. Other neat implementation is turning down or mute SONOS speakers if you take or make a call. On completion of the call, the volume resumes. This is smart, particularly as someone who has a PlayBar for TV audio, it saves me reaching for the remote when a call comes in. The trick will be multi-user support, especially given my wife has an iPhone. The possibilities here are seriously exciting and setting up, configuring or removing routines is super easy. If you have an Android phone and any of these devices, I strongly suggest you check out Yonomi.